We’ve just come to the end of 2 group facilitation training courses!! October has been a busy month for us here in the Voices Unlocked Team. We’ve held both our Women’s group 3-day facilitation training AND our Mixed Gender group facilitation 3-day training all in the second half of the month! Here’s a photograph of an exercise we did in our Mixed Gender training attended by staff working in prisons, secure units and immigration removal centres. It’s a list of coping strategies the training group had used when they’d overcome difficulties. 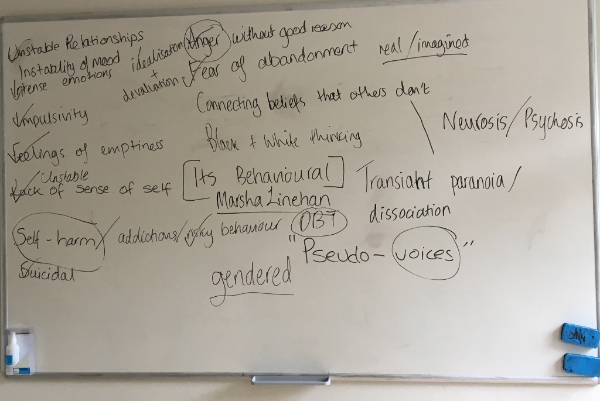 We then talked about how these techniques could also be beneficial to voice-hearers. Staff attended from prisons including HMP’s Bullingdon, Downview and Bullingdon, Eastwood, Wormwood Scrubs, Bronzefield, Pentonville, Isis and Winchester. We had a range of staff from the secure units Hellingly Centre, Trevor Gibbens Unit, Bracton Centre and Brockfield House. From Immigration Removal Centres we had staff from Gatwick and Brook & Tinsley House. Bringing together people working in different types of secure settings and with different goals for the training – e.g. setting up brand new groups, relaunching groups, becoming facilitators for groups already up and running – enabled networking opportunities and a broad sharing of experience alongside learning how to facilitate hearing voices groups. We shall follow up with all who attended and shall work with people closely in a range of ways to develop and sustain groups. Watch this space!